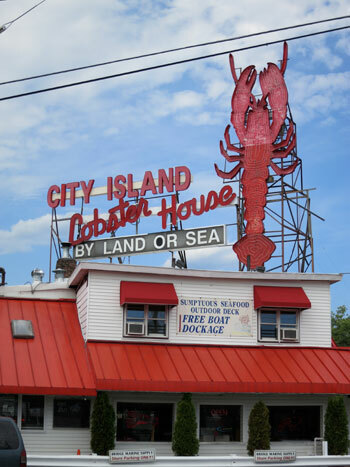 City Island is a fun day trip for adventurous visitors willing to leave Manhattan and travel off the beaten path. Located up in the Bronx (one of New York City's 5 boroughs), this tiny community is surrounded by the Long Island Sound on one side and Eastchester Bay on the other, and is one of New York City's hidden treasures. It has a rich maritime history. City Island was an English settlement in the 1600s, home to oystermen and Hellgate pilots (who guided ships through treacherous waters) in the 1700s and 1800s, and a boatbuilding center from the 1800s through the mid-20th century. During World Wars I and II, many of the military's tugboats, minesweepers and PT boats were produced here. Later on, several America's Cup-winning sloops were constructed at island shipyards too. Today, City Island is mainly a residential community, with knockout water views and a small-town feel that's unusual for New York City. Its charm lies in the fact that it's totally un-touristy. This is not a South Street Seaport. You won't find food courts or street entertainers. But you will discover a scenic, funky little neighborhood, where people live, shop, and take their kids to the local schools on weekdays and to karate and ballet on Saturdays--just like families across America do. But the families who live on City Island also get to fish, and boat, and swim and jump off the dock at resident-only beach clubs at the end of their blocks. I recently had the pleasure of walking City Island with my friend and colleague, Jonna, who grew up here. We peeked into cemeteries and quirky shops and secret alleys. We greeted shopkeepers, and stopped at a nautical junkyard known as Trader John's, where antiques included lobster traps, a needlepoint fish, and old street signs with names like Oyster Island and Lobster Lane. I saw a surfer-dude heading heading from his home to the water with his stand-up paddleboard, and another guy coming out of the bait shop with fishing gear and a bagful of live something-or-other. And as I walked along, I compiled this list of tips for visiting City Island. Start your tour on City Island Avenue. This is the island's main drag, and a good place to get your bearings. It's home to most of the island's shops and restaurants, as well as some awesome 19th century mansions, once owned by sea captains. Pick up the local newspaper, The Island Current ($1 and available at the delis), and read up on neighborhood news while you have an iced coffee at Sugar and Spice or an ice cream cone at Lickety Split. Pelham Cemetary. Photo credit: Ellen Parlapiano. Explore the side streets. Almost every one leads to water (and on the West side, Manhattan skyline views). Along the way you'll pass cute cottages (especially on Tier and Bay streets) and grander homes (head to Schofield Street to see vintage Victorians). Walk west on Fordham Street and discover a hidden alley (just off the southwest corner of City Island Avenue) with tiny houses and blooming hydrangeas. Walk east on Fordham Street past the City Island Diner and the City Island Nautical Museum (more on that next) and hang a left on King Avenue, where many of the bungalows have been in the same family for years. Keep going along King and you'll reach Pelham Cemetery, the only waterfront cemetery in New York City. 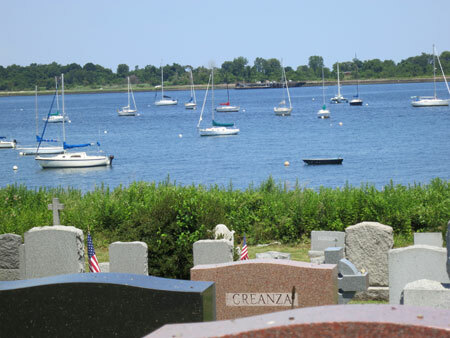 Some graves date back to the 1800s, many with nautical motifs. I was struck by how many of the tombstones memorialized infants, with inscriptions like, “Our Sweet Baby.” Though touring a cemetery may not be your idea of a good time, this one is quite lovely and interesting. > Photo credit: Ellen Parlapiano. Chow down on seafood. It's the specialty here. For fancy-ish waterfront dining, try the restaurants toward the beginning of the island. (I've heard good things about Sea Shore and Portofino). You might also try one of the yacht clubs, like the Harlem Yacht Club (the oldest in the U.S.), City Island Yacht Club or Stuyvesant Yacht Club, but be sure to call first to make sure there's space for non-members. If you crave fast-food style fare and don't mind a more boisterous ambience, head to the end of the island where restaurants like Johnny's Reef and Tony's Pier serve baskets of steamers and fried shrimp that you can eat at outdoor picnic tables overlooking the Bay. (But beware of scavenging sea gulls!) Where do the locals eat? Artie's and The Black Whale (it's got an adorable back garden) are neighborhood favorites, despite the fact that they're not on the water. “People who live here can get the water view anytime,” explains my friend Jonna. Check out the arts scene. 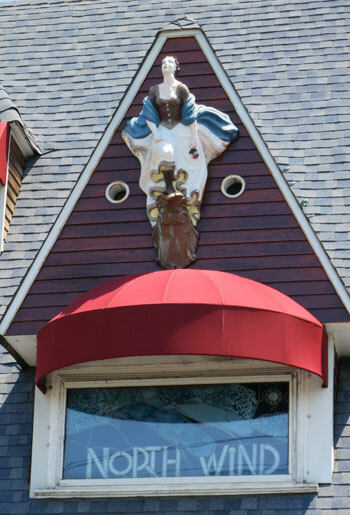 You'll find unique galleries and antique stores along City Island Avenue. Many of them are run by long-time residents, so while you browse and buy, you can chat up the owners and learn local lore. Early Ruth Antiques has some great finds, and Ruth Markowe, the proprietor owns several properties on the island and knows lots about its history. The Focal Point Gallery was founded in 1974 by photographer Ron Terner, who exhibits works from emerging artists. (Focal Point sells handmade jewelry and crafts too.) Across the street, Kaleidoscope Gallery, is an artists' cooperative featuring ceramics, jewelry, toys, candle, soaps, oils and other gift items. On Saturdays, The Starving Artist Café and Gallery has open mike nights, with music, poetry, comedy and performing art. Ride the trolley. If you visit on the first Friday of the month, and are willing to come in the evening, you can ride the free City Island Seaside Trolley, which leaves from Pelham Bay Station every hour from 5:30 to 9:30 from April through December. (You can hop on and off as much as you like, and it also returns you to the station.) Your trolley ticket gets you discounts at select island shops and restaurants, too. But the best part is the lively island vibe on First Fridays. Galleries have receptions where you can meet the artists. Shopkeepers hand out goodies (head to Focal Point for Ron Terner's homemade cookies). And tourists and residents share City Island's quaint charms side by side.